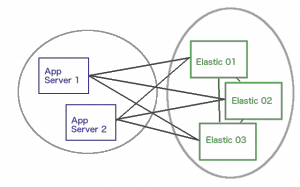 Elasticsearch provides distributed search with minimal setup and configuration. Now the nice thing about it is that, most of the time, you don’t need to be particularly concerned about how it does what it does. You give it some parameters – “I want 3 nodes”, “I want 3 shards”, “I want every shard to be replicated so it’s on at least two nodes”, and Elasticsearch figures out how to move stuff around so you get the situation you asked for. If a node becomes unreachable, Elasticsearch tries to keep things going, and when the lost node appears and rejoins, the administration is updated so everything is hunky-dory again. Nothing too strange, except that our Elasticsearch nodes were living in a different datacenter than our application servers. This turned out to be part of the problem. What about the Elasticsearch ping? As you can read in the Elasticsearch documentation on the Java TransportClient, there are client.transport.nodes_sampler_interval and client.transport.ping_timeout settings that control how often the Elasticsearch’s client checks whether a remote node is still accessible. By default both of these settings are set to 5 seconds, that is, the client sends a ping to each node every 5 seconds and expects a reply within 5 seconds or considers the node to be no longer accessible. So how can its connection to the node possibly be killed by the firewall when a packet gets sent over it every 5 seconds? actually there are (by default) 13 of them! 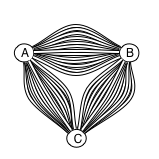 Elasticsearch calls these “channels”, not connections, but from a networking perspective, they’re all regular TCP connections. For more details, as well as how to configure the actual numbers, take a look at the NettyTransport source code. One of these 13 connections is the ping connection. Its purpose is not keeping the real connections used for queries (6 others out of the 13) open, but just to determine whether a remote node is still reachable. So the ping does not prevent our firewall from closing the query connections. But surely Elasticsearch does track of whether the connections are still OK? So doesn’t Elasticsearch periodically check its query connections to see whether they’re OK? Well, no. And yes. It delegates this responsibility to the operating system. When opening a connection to a remote node, Elasticsearch by default sets the TCP socket option “keepalive”. The Elasticsearch documentation for its TCP Settings briefly describes this; it also states that the default is for keepalive to be on. For more detailed information about TCP Keepalive, see the HOWTO. Now with the default settings, it would still take 2 hours plus 8 more probes every 75 seconds = 2h10m before Linux would finally be convinced the connection was dead. That was too long for us. Firstly, because it was obvious our firewall thought 2 hours was too much time for a connection to be idle. Secondly, because if a connection dies, I want Elasticsearch to find out in a matter of minutes, not hours, so it can replace the dead connection with a new one. net.ipv4.tcp_keepalive_probes for the number of probes to not get response for before concluding the connection is dead. I chose values of 600, 60, and 3, respectively. If you’re afraid this will flood your network with probe packets, you can try a more moderate approach. Be aware that this applies to all the connections opened on the system that have the keepalive socket option set, not just the ones opened by Elasticsearch! This will use the watch command to run the netstat command that shows timers on sockets and refresh it every second. You should see a “Timer” column on the right. For keepalive connections, it will say keepalive followed by three numbers in parentheses. The first is the keepalive time. Remember that sockets that were already opened before you changed the settings will still have the old keepalive time! The settings you make with the sysctl command are lost when you restart the machine. To make them persistent, you need to store them in the respective configuration file for your Linux distro (e.g. /etc/sysctl.conf), or simply add the sysctl command to a startup script in /etc/init.d or /etc/rd.d. Properly configured TCP keepalive settings can ensure that connections from an Elasticsearch client to nodes on another network are kept open, even when they aren’t being used for a while. They also ensure that if a connection does die (because a firewall drops it, or because of a network split), the client will be notified quickly. This should avoid hangs and random NoNodeAvailableExceptions when using Elasticsearch from Java. TL;DR : thank you very much ! You really saved our hide with this article. We couldn’t figure out why our bulk indexing batch stopped after one hour. It turns out it was exactly the behaviour described here that was responsible for our problem. And changing the keepalive settings on our server fixed it. Many thanks for both the explanation and the solution. Very helpful – many thanks. We were seeing very similar issues and this has solved the problem. Thanks again for the post. Anytime you have a network connection that traverse a firewall you always have to keep in mind that firewalls close down idle connections. This should come as no surprise. What is a surprise is that ElasticSearch doesn’t offer a some sort of keep alive message at the application layer to keep the connection to the client nodes open. There also doesn’t seem to be a way to detect a dropped connection at the application layer in ES. sigh…. Big thanks! Keep alive tuning is solve problem of suddenly lost connections between ES cluster nodes. … a hack would be I guess to try to catch org.elasticsearch.client.transport.NoNodeAvailableException exception and reconnect to the cluster. but when I checked the keepalive settings on my server, they were 7200, 75 and 9 for keepalive_time, keepalive_intvl and keepalive_probes respectively. Do I need to reduce them ?